The Psilocybe cubensis MycoMate® Thai Magic Mushroom grow kit is slightly different than the grow kits you might have used before. This is seen only in the substrate recipe and is a secret not just shared with everyone. Not even with us! Close any open windows. Wind or draft may bring microorganisms that can contaminate the Psilocybe cubensis 'Thai' Magic Mushroom grow kit. When taking out the grow box with the cake from the carton box, put it on a disinfected surface. If this surface would not be clean, microorganisms may attach to the grow box and will flourish inside the Psilocybe cubensis 'Thai' Magic Mushroom grow kit and will contaminate the grow box. Place the paperclip on the fold, so the bag stays closed. Now the Psilocybe cubensis 'Thai' Magic Mushroom grow kit is ready to grow. 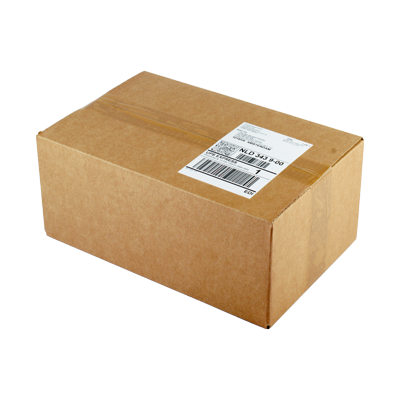 Place the Psilocybe cubensis 'Thai' Magic Mushroom grow kit inside the carton box, on top of the ziploc with lid. Read, download or watch the instructions for the MycoMate® Thai magic mushroom grow kit. The Psilocybe cubensis MycoMate® Thai Magic Mushroom Grow Kit only needs light for the mycelium to ‘understand’ it has reached the surface. Only then, mushrooms will grow. A few hours of fluorescent/artificial light or indirect sunlight a day is more than enough. 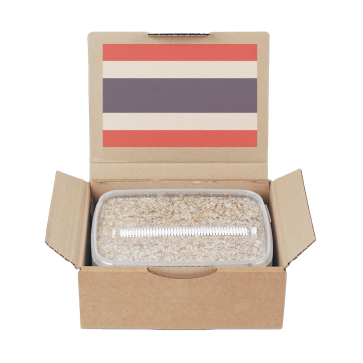 Direct sunlight kills the mycelium, so avoid the sun to shine directly on the grow kit. To continue, follow the same steps 3 – 7 as before when you started the process for the first time. Several days later, a new flush will appear. You can get at least 2 or 3 flushes out of a Psilocybe cubensis 'Thai' Magic mushroom grow kit. If you are experienced in cultivating, you can get more flushes out of a kit. When no more mushrooms grow out of a grow kit after the second flush for at least three weeks, or when the Psilocybe cubensis 'Thai' Magic Mushroom grow kit turns green, red, grey or yellow; the grow kit can be disposed of. The change in color is a sign that the grow kit is contaminated with another fungus or bacteria. No more mushrooms will grow out of the Psilocybe cubensis 'Thai' Magic mushroom grow kit and the grow kit should be thrown away in the garbage outside.